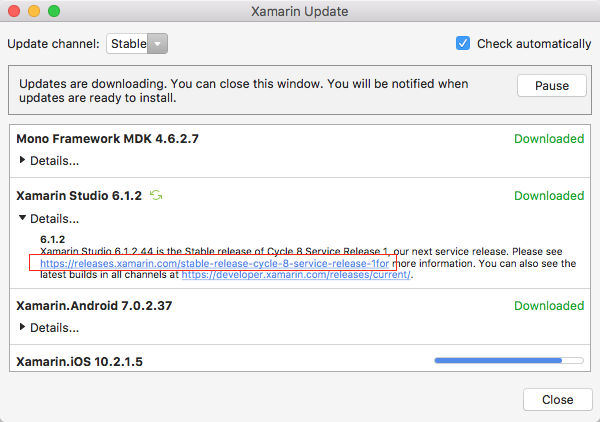 Please see https://releases.xamarin.com/stable-release-cycle-8-service-release-1 for the details about this release, including the steps to update or downgrade as needed. None. This release includes candidate fixes or improvements for each of the higher-visibility known issues that were listed in the forum announcement for the previous release. Note that the bug numbers in this query include some non-public bugs as well as some bugs that were included in the Stable channel Xcode 8.1 compatibility update from October 27. [Xamarin for Visual Studio], [Xamarin Studio] - Upcoming compatibility feature, tracked in 44330 - "This version does not have support for files saved in Xcode 8 format" appears when attempting to edit a file with the Xamarin iOS designer after having edited the file with Xcode 8. Xcode 8 introduced a new, non-backwards-compatible XML format for Interface Builder documents that is not yet supported in Xamarin's iOS designer. As it turns out, Xcode 8.1 from Apple has in fact backed out of several of those format changes. Candidate fixes are now under test for Xamarin's iOS designer to cover the remaining format changes as present in Xcode 8.1. [Xamarin Studio] - 43188 - Sporadic "Out of memory" error during build leaves solution in an unbuildable state until the project is reloaded. Improved in this release: Cycle 8 Service Release 1 includes some fixes that should hopefully eliminate the need to reload the project in this scenario. Additional fixes for the "Out of memory" error itself are also planned. EDIT Nov 14: Correct a typo in the fixed bugs query. I use Xamarin for Visual Studio, with Xamarin Forms project Android. In this article https://developer.xamarin.com/guides/android/getting_started/installation/windows/manual_installation/ we can see these versions but I think it is not always last release. Indicates also what last API Android version (25, 24, 23) it is possible to use without bugs. It is essential to install the 32-bit version of the Java JDK even if you're using 64-bit Windows. It is also important that v1.7 of the Java JDK is installed (although it is fine to have 1.8 or newer installed at the same time). The link to the fixed bugs is not working. I get a "Software Error". The device was disconnected. Please reconnect it and try again. Should I open a bugzilla issue for that @BrendanZagaeski ? Note: it work on device and google emulator. Ended up running the Xamarin installer again and it fixed it. Thanks for the heads-up! The typo in the link that was causing that should be fixed now. Thanks for the heads-up! I have requested a typo correction for that URL now too. It used to work fine, but stopped working in the previous stable release. I have tried all of the suggested worarounds to no avail. The release notes seem to suggest that the issue "Android Designer shows progress indicator indefinitely" has been addressed (items 44997 and 43948). I am still getting the same issue in the latest stable release (.58). Are there still known issues with this ? I have a very big problem, I can not install this version and now I can not use Xamarin. It is the same if I try to repair or uninstall Xamarin. I am now completely blocked and I can no longer use Xamarin. I have a problema when I try to install the last update stable. Surprise, Surprise....... I t looks like to use the iOS Simulator in Windows you now must have Visual Studio Enterprise. I hope I am wrong but I noticed that when I did the latest upgrade to stable the check box to enable the iOS Simulator in Windows was no longer available. I then looked at the docs for the iOS Simulator for windows it now says Visual Studio Enterprise. If this is true then this would be a terrible move on Xamarin's part. It could be the first step in clawing back free features to paid subscriptions. The other note that might be relevant is to double-check that 64-bit Java JDK 8 (1.8) is installed and set as the active version under Tools > Options > Xamarin > Android Settings > Java Development Kit Location. There were some fixes around missing error messages for that scenario, but it's possible there might be some remaining edge cases that still show a loading indicator indefinitely rather than properly surfacing the error message. This version sneaked out yesterday (I think there were two releases in the "stable" channel) breaks compiling against Forms 2.3.2 stable. Updating to 2.3.3. pre-4 fixes this. Version 4.2.1.60 for Visual Studio 2015. Same old story with stable releases of late. I found a way to make the Android XAML designer work. Originally I could not open any XAML files. Then in solution explorer, I right clicked an Android layout xaml file and selected "Open with". This brought up a list of choices and I selected the default entry "Android Layout File" and then clicked the "Set as Default" button (despite the fact that it was already the default). I then exited Visual Studio and it started to work as it should do. It is still a bit hit and miss, but when it fails now I usually restart visual studio and it fixes it. Also, I have an Enterprise license but still have issues with the IOS Simulator for Wndows as pointed out in the earlier post (keep getting error Failed to install //Users/Username/Library/Caches/Xamarin/mtbs/builds/MyApp_IOS/c376935bf9404592497ac41462cd1465/bin/iPhoneSimulator/Debug/MyApp_IOS.app to 4D9D13A9-437F-4356-B21C-C0FA8D65B78C). Does anyone know the reason why duplicate widgets appear in the Toolbar? And so the red underlined InitializeComponent() bug is back. UNBELIEVABLE! I can't deploy Android projects anymore with this latest release. Neither to devices nor to emulators. Never had issues like this before. Opened a ticket for it. Seems to be similar to what @jzeferino mentioned.